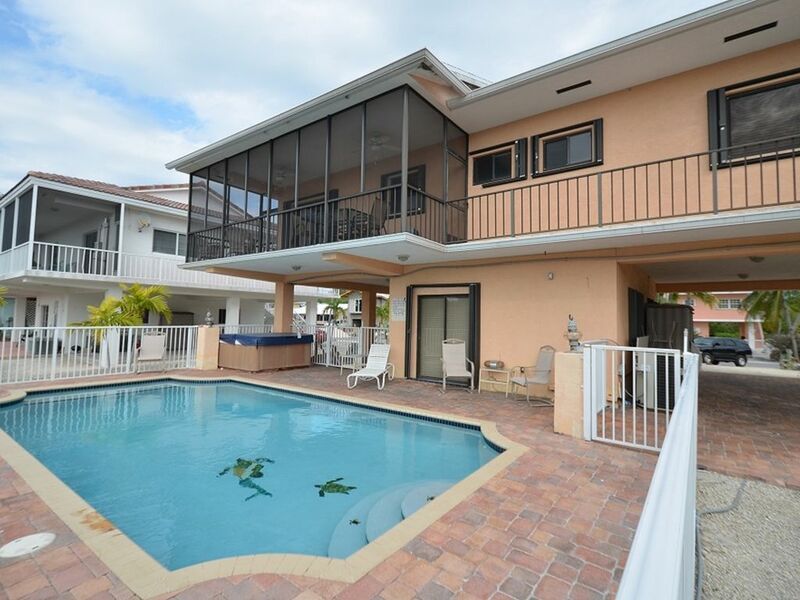 This beautiful, four-bedroom, three-bath house is conveniently located in the heart of Islamorada, the fishing capital of the world. Situated in a beautiful upscale neighborhood of all waterfront homes, the house is equipped with all the comforts of home. It is extra clean and modernly furnished. Upstairs there are three bedrooms and two baths. Downstairs there is a totally independent, one-bedroom, one-bath apartment. The house is PERFECT for those traveling with different age groups, in-laws, teenagers, or two families. The house is fully equipped with everything you will need to make your vacation a 'PERFECT' one. Spend your days soaking up the sun and your evenings relaxing in the jacuzzi or in our HEATED swimming pool. THIS IS PARADISE! Being just one-and-one-half hour from Miami and one-and-one-half hour from Key West, you can easily spend a full day in either of the two, and be back on time to watch the beautiful sunset. We are just one mile from world-famous Holiday Isles, TIKI BAR. There you can sit out by the beach, or take a dip in the pool. Their live entertainment and contests give your vacation the full island effect. As if diving, snorkeling, sunning, boating, and swimming all day were not enough, do not forget to spend an afternoon swimming with the dolphins or the stingrays. Also, just one minute from the house. Come and spend you PERFECT vacation at THE PERFECT GETAWAY!!! Great house for 2 families to share. Updated rooms, clean, well kept. Nice kitchens, pool, and hot tub. The house was very very nice. The owner was hands on if we needed anything! Very comfortable. Easy to clean! Loved it!!!! Nice rental with a few issues. Owner was very responsive even at 3am when the fire alarm went off. Some unavoidable issues line construction at neighboring house and toilet running, but overall very pleasant stay. John, it was a pleasure having you and your family vacation in our home. Sorry about the smoke alarm going off. We had passed our fire inspection that morning and they were reset by the fire inspector in order to test them. The battery moved slightly and that caused for one detector to loose full contact As a result, all detectors go off. I am glad we were able to resolve it right away.... Sorry for the scare. I was aware of the neighbor across the street was remodeling their home. I apologize if they caused any noise or may have disrupted your stay. I am glad that you enjoyed our home. I hope to hear from you again. Thank you Scott. It was a pleasure having you and your family as guests. I hope to see you guys again soon. Bedroom set up including downstairs was great for corporate trip or needing some privacy for guests. Location perfect for fishing charters and all the great restaurants. Nicer quality for bedrooms I thought and again a very functional layout for business trips. I will keep in my 'favorites' for future trips to Islamorada. We were a party of 8 (4couples) felt at home right away, we sat out in the screened porch every morning for coffee and most evening for a night cap. Pool and hot tub were great good size. House is close to lots of restaurants which all of them had great food, lots of really fun island atmosphere bars that we enjoyed very much. Rented a boat for the day and had a great time on the water. A short 1hr 45 min to Key West which was a great experience. 1hr 45min the other direction we were in Miami for the day another great experience. We also did the Homestead Race which was only about 1 hr away. And there is even more to do we just didn’t have the time to do it all we were there 6 days. Would recommend this place it was Great!! We are centrally located in the heart of Islamorada, with all sorts of water activities at your finger tips.